Hemo G the RBC is a hip-hop kind of guy. My name is Hemo G and I'm an RBC. I travel through your body in your capillaries. then I take it to the cells that are everywhere. but I come back for more and I get busy. and I'm the one who takes it there. I have inside me a little piece of iron. It acts like a magnet to pull in oxygen. taking it to the cells is what makes you grow. 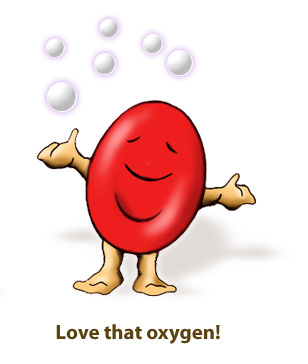 Oxygen in, that's what I'm about. Carbon dioxide, I take it out. To learn more about me, go to the air exchange section of this website.